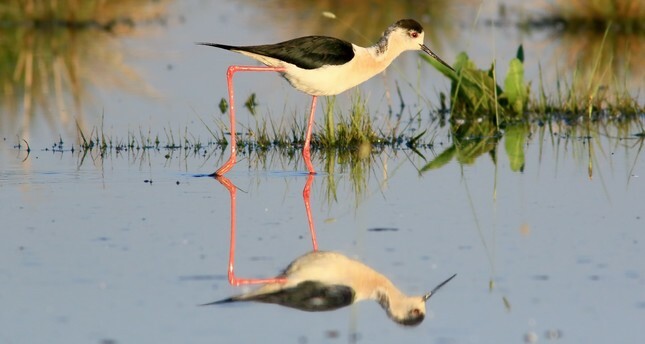 Acıgöl, translated as Lake Bitter in English, which is one of the most important wetlands in Turkey, has become a huge attraction for bird watchers and photographers thanks to the number of different bird species it houses. Located between Burdur and Afyonkarahisar provinces in western Anatolia, the Acıgöl wetlands are one of the major flamingo breeding grounds in the country. The lake is believed to host over 160 different bird species belonging to 22 different families. Speaking to Anadolu Agency (AA), chairman of Frig Photography Foundation Murat Özçelik said Acıgöl is one of the destinations that every photographer - amateur or professional - should visit at least once. "It is possible to capture the best photographs here. The most-photographed birds are flamingos, as they are highly photogenic. From May to October, Acıgöl is a heaven for photographers," said Özçelik. Nature photographer Arif Birsen said it is possible to take good shots of the birds in Acıgöl, adding that the lake is a popular spot for photographers throughout the year. "Flamingos are the lake's biggest attraction. There used to be hundreds of flamingos here but the water level of the lake is decreasing every year. The water levels affected the natural life around the lake as well."